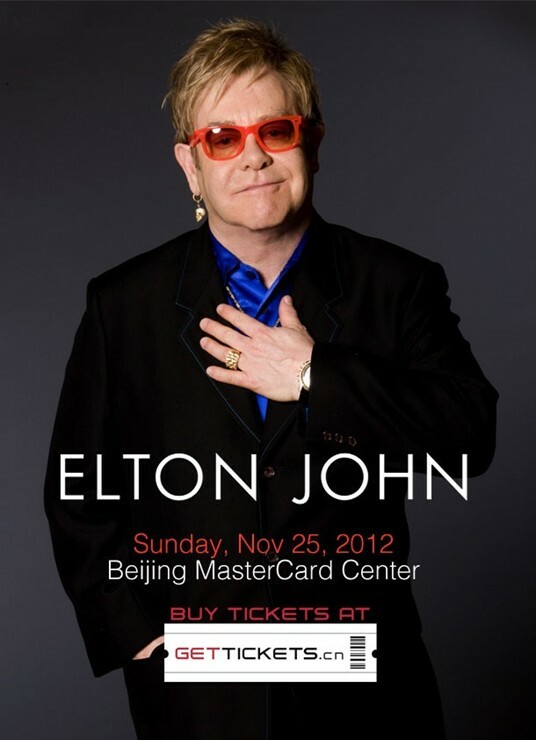 Home » concert » Elton John in Concert in Beijing! Elton John in Concert in Beijing! I had the opportunity to attend Elton John’s concert in Beijing tonight (thanks to my dear friend Plum for her kind invitation)! This was Elton John’s first time performing in Beijing and it was truly a stunning evening full of musical entertainment. The concert started with an absolutely awesome duet by 2Cellos playing Michael Jackson’s ‘Smooth Criminal’ (watch the video below). I was blown away by their talent as well as the emotion in their performance. Apparently Elton John found their video on youtube about a year ago and called them personally to invite them to join him on his world tour! What I loved most about the concert was that it was purely about the music. Elton John sang each song without any breaks – no wardrobe changes, no gimmicks – just his piano, voice and his incredible band backing him up. I was fascinated watching the other musicians and how well they complemented him on the piano without overpowering him. One of my favorite parts was listening to the band jam together. There was such great energy and it looked like they were having a party on stage. Several times even the cellist was up dancing while jamming on his cello. I was touched to see two of the original band members still playing from when the band started in 1967 – the drummer (who must be in his late 60’s) and the main guitar player. Below is the video of the 2Cellos who started the concert tonight with this piece (just disregard the play-fighting part which I didn’t care too much for). I hope you enjoy the music as much as I did! I love Elton John! I remember watching “Nikita” sometime around 1989, and “Sacrifice” and “I’m Still Standing” are still among my favorites. Lucky you! interesting jamming on the cello! Wow! That 2Cellos song is impressive! I’ve not thought of that cover working, but they pulled it off!